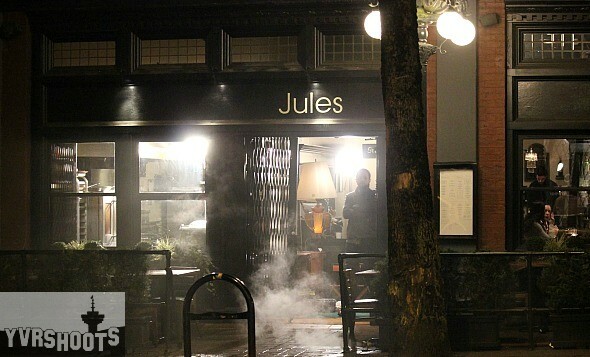 Killer monsters thriller Breed took over Jules French Bistro in Gastown tonight to shoot a scene of Tacoma detective Cooper Wells (Justin Chatwin) dining inside and then standing up suddenly and exiting the restaurant. Not The-Walking-Dead kind of action I expected from this TNT pilot based on John Scott Shepherd’s novel Life or Something Like It, about a series of brutal killings by a mysterious race of barbarous creatures in the Pacific Northwest. 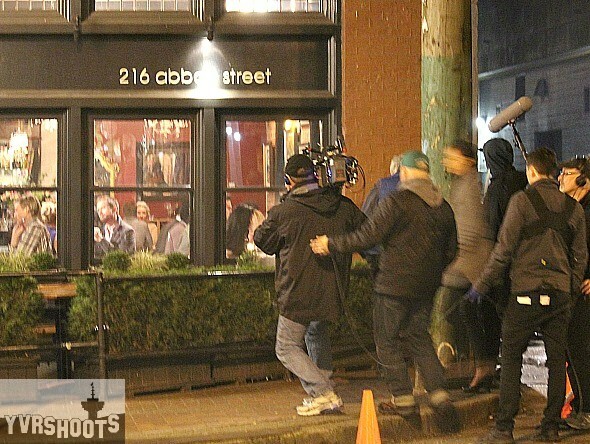 Most of the 75 extras on set seemed well-dressed citizens not killer monsters but this is only the first week of a three-week shoot in and around Vancouver. Canadian comic Shaun Majunder co-stars as Cooper’s new partner in the Tacoma Police Dept. That’s Justin Chatwin standing in the Jules doorway. Lights of a Breed Mercedes van headed to set. Breed shot in the underground parking lot beneath the Queen Elizabeth Theatre on Tuesday, which seems a more likely venue for killer monsters than a French bistro on Wednesday. 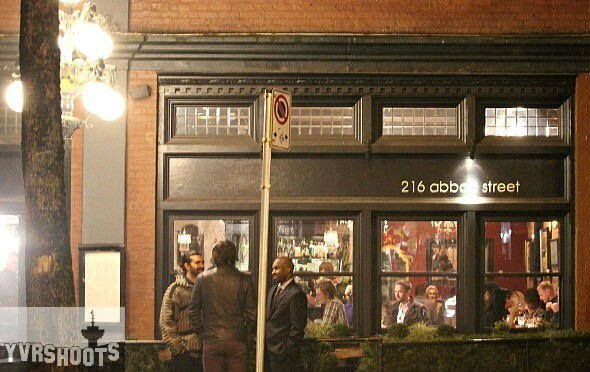 Update: Breed moved on to film overnight in the Koret lofts in Gastown on Thursday and Friday nights (March 5th and 6th). And staged a four-storey stunt fall into the alley behind.